Below, Cover Highlights: Original artwork by JD, as selected in a jurried competition, on the front cover of 2007. Original artwork by Alexis on the back cover of 2005. 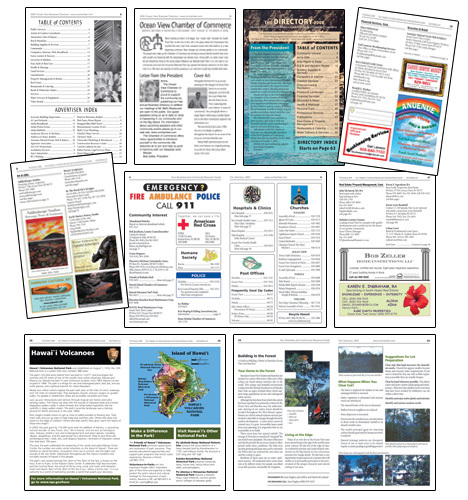 Below: Inside sample pages. 2005 was still all black ink inside, from 2006 on, it was full color all the way. 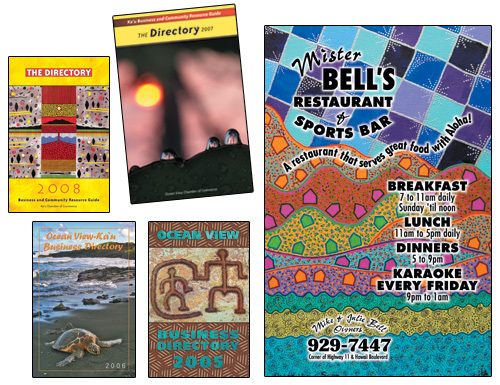 My work on The Directory was more than a design job packed with ads and information. It was a full on life experience. During my years with the Chamber of Commerce, I was involved on many levels. Production of the cover art contest for three years, development of the Chamber scholarship program, maintenance of the Chamber website. Plus, two years sitting on the Chamber Board of Directors.